I'll be honest here. This deconstructed vegetable lasagna is only partly representative of what we've been eating in the past couple of weeks—due in part to the advent of apple cider-season and therefore, in my mind, the graceful exit of eggplant season, but mostly due to the fact that for nearly a week our refrigerator was filled to bursting with leftovers from Heidi's and Bill's wedding (you remember Heidi, from the purple bridal shower? ), which is really just one of the many perks that come with having them for roommates. But let me not pooh-pooh this faux-lasagna before you've even tried it, because it stole the show one evening, and, like a first date where everything just seems to click, I haven't been able to get it out of my mind since. Roasted eggplant, garlicky tomatoes, creamy ricotta... it might be time for a second date. 1. Heat oven to 400 degrees, with an oven rack in the middle height. Slice the eggplant into ½-inch rounds, then chop the rounds into (approximately) ½-inch square pieces. Lay the pieces on a baking sheet, drizzle with 3 tablespoons oil, and sprinkle with a generous amount of salt and black pepper. 2. Bake the eggplant for 20 minutes. Loosen and turn, and return to the oven for another 10 to 15 minutes, or until fully browned and soft. Remove from the oven and set aside. 3. While the eggplant is in the oven, heat the remaining tablespoon olive oil in a large sauté pan over medium heat until the oil shimmers. Toss in the chopped garlic and cook for about 30 seconds until fragrant, then add thyme and cook, stirring, for about another 30 seconds, until fragrant. 4. Add the diced tomatoes and red wine vinegar to the pan, and mix it all together. Let the sauce come to a boil, then turn the heat to low and let simmer, uncovered, while preparing the rest of the lasagne. 5. Meanwhile, prepare the pasta al dente in a large pot according to the package instructions, and drain thoroughly. Return cooked pasta to the pot and stir it with a drizzle of olive oil to keep from sticking. 6. 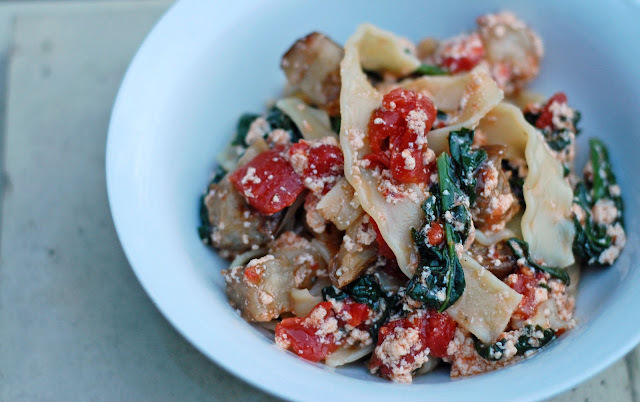 When both the eggplant and the pasta are done, turn back to the tomato sauce and stir in the spinach. Let simmer for about 2 minutes, until the spinach has wilted, then remove the pan from the heat and stir in the ricotta. 7. Add the sauce and the eggplant to the pot of pasta, and stir gently until combined. Serve hot. OMG, you got me on this one. My Italian food addiction is rearing its head. I wish you could bring this to my house. I'm in love with a recipe.